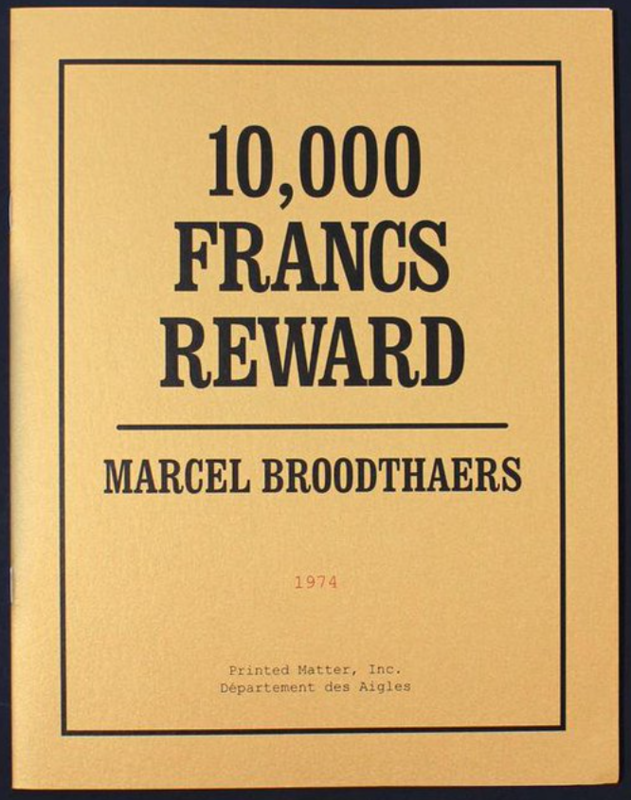 Printed Matter, Inc. and D​é​partement des Aigles Brussels are pleased to announce the publication of 10,000 Francs Reward ​(Dix mille francs de récompense) ​by Marcel Broodthaers (1924 – 1976)​,​ translated by editor Elizabeth Zuba in collaboration with Maria Gilissen Broodthaers​ and appearing in English for the first time. 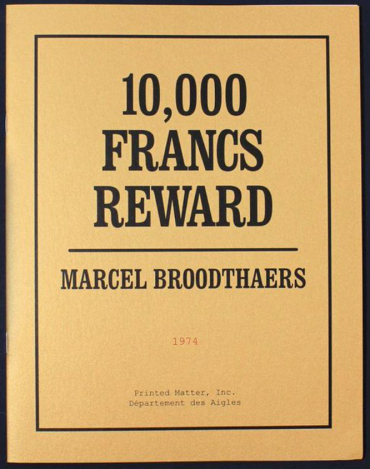 10,000 Francs Reward – a “20th Century Art Treatise” – is realized as a performative self-interview​ in which​ Broodthaers’​s questions and answers run together in a single​, ​fluid ​body of text. The work​ first appeared in connection with the artist’s Catalogue/Catalogu​s​ exhibition at the Palais de Beaux-Arts, Brussels, 1974​, inspired by a conversation with art critic Irmeline Lebeer. Broodthaers’s art-historical text casts light on the motives that have given shape to his broad and evolving practice as a poet, artist​, filmmaker and ​curator​. Across four sections – OBJECTS – INDUSTRIAL SIGNS – THE FIGURES – THE FIGURE OF THE EAGLE – 10,000 Francs Reward ​examines​​ the creation and framing of art generally as well as Broodthaer’s own specific symbology, giving meaningful insight into some of the objects​ and ​images that recur​ through​out​ his work​.​ Variously anecdotal and aphoristic, the text piece also ​resonates with​ the artist’s characteristic humor (“It is Ingres who interests me, not Cezanne and the apples”). Appearing in the years following the closure of Broodthaers’​s​ ​conceptual museum ​Musée d’Art Moderne, Département des Aigles – which he ​founded and “directed” ​(1968-1972​)​, and which served as a proto-interdisciplinary platform for a series of installation-like “presentations” – 10,000 Francs Reward continues the exploration of a set of themes initiated by that body of work, ​exploring the ​nuanced role​ of artists and their ​relationship​ to the museum/institution​/gallery. Situated both in and against a conceptual/Surrealist lineage (“I hope I have nothing in common with that state of mind!”), this text lays the groundwork for a new kind of contemporary art-practitioner whose work ​confronts and engages​ the tenuous bind between ​art object, language and meaning/message, as well as audience, and the necessary implications this has on notions of authenticity​ and ​artifice.